Elegant and dramatic Mediterranean trees. 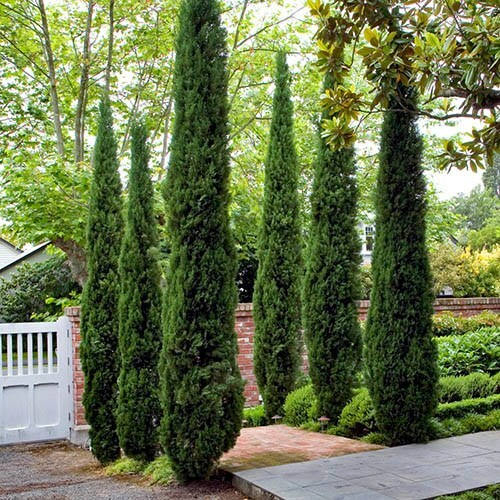 Treat yourself to a pair of these gorgeous Italian Cypress trees, and add a touch of Mediterranean class to your garden. Seen all over Italy, these spectacular architectural conifers will add height and year-round interest wherever you plant them. With their elegant, pencil thin form, they’ll look simply stunning framing a door or gateway, or in a terracotta pot. Not to be confused with vigorous Leylandii, these slender, manageable beauties are slower growing and wont get out of hand - you can even grow them on your patio! They are of course very drought tolerant, but also completely hardy and evergreen, so they’ll thrive here in the UK and look magnificent all year round whatever the weather! For best results, remove the cones that appear, as these can pull the branches apart, losing shape. They can reach 10m in 20 years or so, yet remain very upright and narrow at 1-1.5m. Supplied as a pair of mature Italian Cypress (Cupressus sempervirens) trees in 20cm diameter pots. Height now: 1.2 -1.4m (4-5ft), with bamboo cane support. See image of Richard holding a plant for relative size of what is delivered from stock.